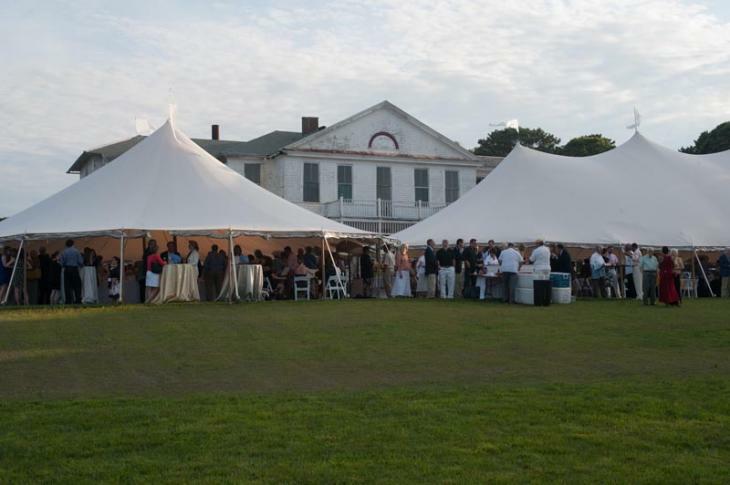 Evening of Discovery, the museum's annual fundraiser, is currently the only event held on the grounds of the former Marine Hospital in Vineyard Haven. The former Marine Hospital, now owned by the Martha’s Vineyard Museum, could become an event venue in the near future if the Tisbury selectmen approve. David Nathans, executive director of the museum, came before the selectmen Tuesday seeking approval to use the property for up to 12 events a year, including weddings. The museum, which has long been situated on a campus in downtown Edgartown, bought the Vineyard Haven property in 2011 for $2.9 million. Since then ambitious plans have been in the works to raise millions of dollars to renovate the property to permanently house the museum and its collections. The museum does not yet occupy the property except to use it for its annual Evening of Discovery fundraiser, scheduled this year for June 27. Speaking to the selectmen at their regular meeting Tuesday, Mr. Nathans said the museum would like to do more by holding both nonprofit and for-profit events at the site, which sits on a hillltop with commanding views of the Lagoon Pond and outer Vineyard Haven harbor. His proposal includes an allowance for two small seasonal tents and one larger tent, which would not be a permanent feature, to accommodate special events. “A number of organizations — nonprofits, as well as some individuals who are looking for a venue for a wedding or an anniversary party have approached us and right now we can’t respond in any positive way to any requests,” Mr. Nathans said. “We have no ability to offer the site for weddings for example and what happens is they go elsewhere and we miss out on revenue that could help us,” he added. Town administrator John (Jay) Grande said none of the proposed activity would jeopardize the museum’s nonprofit status, based on a discussion he had with the town attorney. Mr. Grande expressed the importance of the museum balancing its educational, nonprofit activities with events that are expressly for-profit. “In order for this project to move forward they need to have better defined proposed uses,” he said. Mr. Nathans said the idea would be to hold 12 large events over the course of a season running from June through September. “Six would be nonprofit potentially and six would be for-profit. Most of the nonprofit events don’t have music and oftentimes they are over pretty early,” he said. Mr. Nathans offered that he would be willing to hold events less frequently or only in the afternoons. “If we can only offer weddings for example in the afternoon and they have to be over by eight, that’s fine,” he said. “And we could accept a more limited number if you wanted to try that,” he said. “Right now we are not able to offer any of this and we would like to, within the same regulations that we follow for our fundraiser,” he said. Selectman Melinda Loberg echoed Mr. Israel’s concerns and suggested a public hearing to give the neighborhood the opportunity to weigh in on the proposal. “I don’t feel like the three of us can say limit it to seven events or something. We would like to know what they are or might be and then hear feedback,” she said. Chief Schilling suggested contacting the preservation trust to review the terms agreed on with the town for hosting events. “They have been able to come to terms with their neighborhood and it works very well down there,” the fire chief said. After a lengthy discussion, Mr. Israel closed the matter, resolving to revisit the proposal in two weeks after more study. In other business Tuesday, the selectmen approved the annual triathlon road race for Sunday, Sept. 13, and closed a public hearing on Bruno’s proposed rate increase for curbside trash and recycling services without taking any action. The hearing will be readvertised in September, once the board has learned more about alternative solutions to a rate increase. Selectmen said they will take into account suggestions that have been made at the various public meetings on the topic before issuing a final ruling. Robert Breth of Bernice’s Ice Cream and Fudge had a common victualler license approved for operation at 22A Main street and was wished well by the board. “It’s great to have a new ice cream place on Main street,” Mr. Israel said.